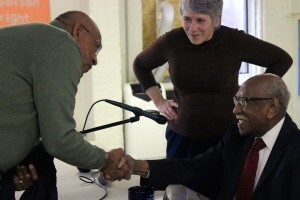 Chicago civil rights activist recounts time with Dr. Martin Luther King Jr.
That’s how long-time Chicago civil rights activist Timuel Black remembers the Rev. Dr. Martin Luther King Jr.
“And it made you ashamed to act like you were afraid of anything if you were with him,” the 96-year-old Black said during services Sunday at Third Unitarian Church, 301 N. Mayfield Ave.
Black, along with several other local activists, assisted King in organizing Chicagoans for the March on Washington in August 1963 when he delivered his famous “I Have A Dream” speech in front of the Lincoln Memorial. “He could articulate in understandable but also spiritual tones why we should be going forward,” Black said. As the grandson of slaves, Black was steeped in the Civil Rights movement of the 1950’s and 1960’s. He also worked alongside other prominent figures, including activist and entertainer Paul Robeson and Chicago’s first black mayor, Harold Washington. Black taught for Chicago Public Schools and served in the U.S. Army during the World War II during times of intense segregation in America. It was evident that King worked tirelessly in his efforts to bring about change, Black said, and adopting the non-violent approach King encouraged was something Black and others from the North struggled with. Aggression toward racist whites in the South could result in immediate retaliation. Groups like the Ku Klux Klan were heavily concentrated in the South, and blacks were lynched for any reason. “With most of us from the North, it was a tactic,” Black said, as he recalled one particular time King visited Chicago and tensions between black and white escalated. The crowd responded with laughter to Black’s story as he went on to describe more of King’s character as a leader. “Dr. King was a leader, and I mean that in every way that you can describe it,” he said. Brenetta Howell Barrett, 82, who also helped organize for the March on Washington, attended Sunday’s services. Barrett organized trains going from Chicago’s Union Station to Washington, D.C., for the 1963 march, she said; those trains were packed with participants. Barrett, who raised four children during this important time in history, also recalled how personable King was. “The reason I remembered that so well was because they had no hot water, and you couldn’t shower because the water was so cold,” she said with a laugh. But what was most memorable about this time, Barrett said, was that King was a listener, and that was important. During Sunday’s talk, Black recalled moments he spent with King before his assassination in April 1968 outside the Lorraine Motel in Memphis, Tennessee. Audience members asked about more recent events, including shootings and killings by police in Chicago. Was there any time during the movement that he gave up hope? No, Black said. And he still hasn’t given up hope, he said. “I felt there would be a delay, but I never lost hope that the change was going to come,” Black said. Randel Josserand, the chief of schools in the Austin and Belmont Cragin neighborhoods, will talk at 10 a.m. Jan. 14, followed at 11 a.m. by Brenetta Howell Barrett, who will discuss the lessons she learned from the civil rights movement. West Sider Terrell Brockington shares a poem his daughter wrote years ago about this important issue. The Loretto Hospital and state Rep. La Shawn Ford will be commemorating the civil rights leader at an event that celebrates life before, during and after recovery. The event will be held from 11 a.m. to 1 p.m. Jan. 21 in the hospital's sixth floor auditorium at 645 S. Central Ave. Celebrate MLK Day by seeing the movie "Selma"
Celebrate Martin Luther King Sunday at 3 p.m.